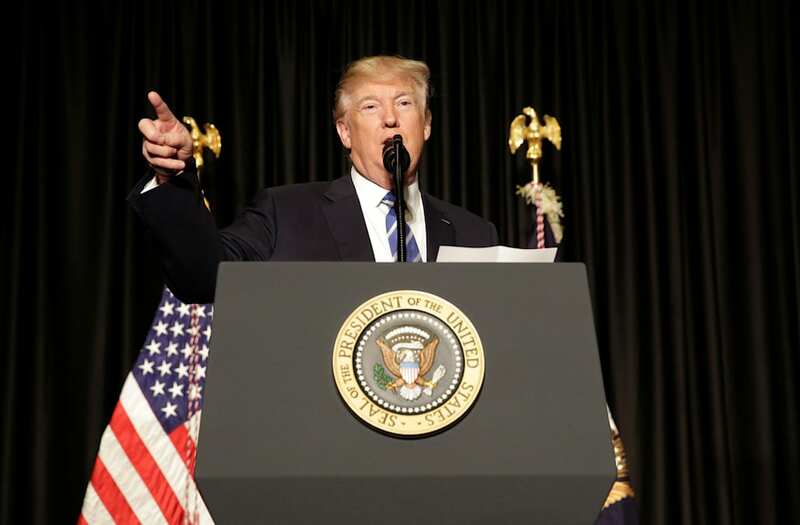 President Donald Trump on Wednesday went on offense against a panel of federal judges who are weighing whether or not a court order blocking the president's executive action banning travel from seven Muslim-majority countries should be lifted. Trump went after the judges during a speech addressing police chiefs and sheriffs, saying even a "bad high school student would understand this. Anybody would understand this," before reading a portion of an immigration law he believes grants the president power to enforce such orders in ensuring the "security of our nation, of our citizens." "It couldn't have been written anymore precisely." "Whenever the President finds that the entry of any aliens or of any class of aliens into the United States would be detrimental to the interests of the United States, he may by proclamation, and for such period as he shall deem necessary, suspend the entry of all aliens or any class of aliens as immigrants or nonimmigrants, or impose on the entry of aliens any restrictions he may deem to be appropriate," Trump read and periodically paused to add emphasis on certain phrases. "So, if I find as president that a person or group of people will be detrimental to the interest of the United States, and certainly there are a lot of examples," said Trump while reading a portion of immigration law 8 U.S. Code 1182. The president said he was disgusted while watching coverage of the emergency hearing Tuesday night that the White House called for to overturn a lower court's decision to temporarily freeze the administration's travel ban. "I watched last night in amazement and I heard things that I couldn't believe. Things that really had nothing to do with what I just read." Trump continued, "I have to be honest. If these judges wanted to help the court, in terms of respect for the court, they'd do what they should be doing. It's so sad." "I don't ever want to call a court biased, so I won't called it biased. But courts seem to be so political. It would be so great for our justice system if they would be able to read a statement and do what's right." The president stopped short of calling the court biased, but did say it "seems to be so political." "It would be so great for our justice system if they would be able to read a statement and do what's right." Trump also said the law was "not politically correct." "The only mistake is they should have said 'he' or 'she'," said Trump. "But hopefully it won't be a she for at least another seven years."